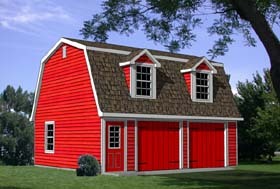 Question: what are the garage openings? Question: What sq ft on top & buttom? Answer: Upper Level - 449 SF. Lower Level - 572 SF. Question: What would the average total cost with all labor and materials would it cost for someone to build this apartment? Answer: Depending on the location of the project and quality of materials the cost for the apartment only would be around $60.00 – $90.00 per S.F. Question: how many dwgs are included in these plans for garage 94343 and what do they incompass as far as details? Also, does this come with a material takeoff and can you send me an example of your work before I purchase? Answer: The drawing set consists of six sheets containing the general notes, foundation plan, foundation details, floor plan, optional upper level floor plan, exterior elevations, interior elevations cross section, framing details, floor and roof framing plans, electrical plans, and optional solar details. Yes you can purchase a material list for this plan, and you can buy a study plan for this project. Question: what is height of main garage level 8' or 9'. Trusses or TGI for 2nd floor? Monolithic slab or footing/block foundation? Answer: The height of the main garage level is 8' from the top of the foundation. The floor joists are 2x12 douglas fir spaced 12" o.c., you can use TJI/210 11 7/8" spaced 16" o.c. The foundation is designed as a monolithic slab. Question: I like this garage plan #94343 but you only show the front and one side-does the back have dormers? windows? other end windows??? 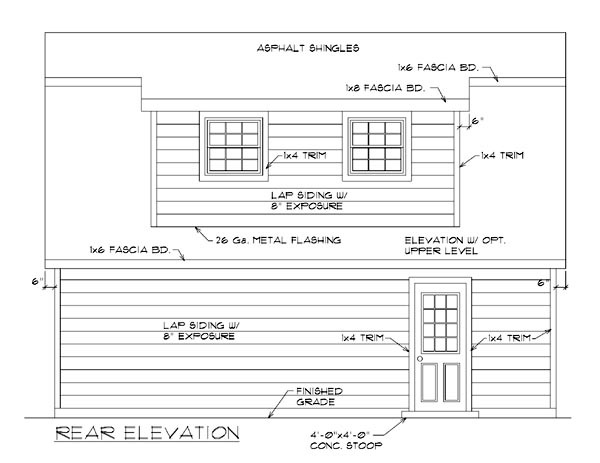 Answer: The rear elevation has a shed dormer with windows in the kitchen and the bath. The lower level has two windows on the right side.